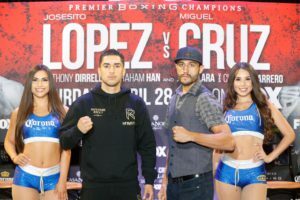 Yuriorkis Gamboa and Abraham Lopez Upset in Las Vegas! 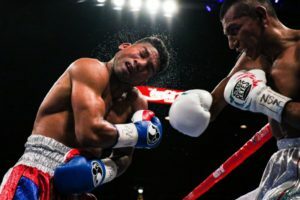 At the Cosmopolitan of Las Vegas Ballroom, in Las Vegas, NV, former 2004 Olympic Gold medalist, WBO lightweight, interim WBA super featherweight and WBA Super and IBF featherweight champion from Cuba Yuriorkis Gamboa returned to Las Vegas for the first time since 2012 and may have seen his career come to an end. It was a Golden Boy Promotion over ESPN2 in a night of upsets. In the main event lightweight Yuriorkis “El Ciclon de Guantanamo” Gamboa, 26-2 (17), of Miami, FL, was upset by Robinson “Robin Hood” Castellanos, 24-12 (14), of Celaya, MEX, at the end of the seventh round having scored several knockdowns over Gamboa. In the first 2 rounds there was not much action with Gamboa having an edge. In the third round a jab by Castellanos followed by a right to the chin of Gamboa and down he went. In the fourth round a lead round house right hand by Castellanos on the chin of Gamboa and down he went. In the fifth and sixth rounds Gamboa came back with flurries backing up Castellanos who went right hand crazy with few landing. In the seventh round Castellanos rocked Gamboa with a right to the head but was outworked by Gamboa who seemed like a shell of his former self. The 35 year-old Gamoba advised his corner to stop the fight in between rounds after the seventh round. Gamboa has had four years of inactivity during his career at different times and it caught up with him. Russell Mora was the referee. In the co-feature Abraham “Chamaco” Lopez, 22-1-1 (15), of LaPu nte, CA, lost his WBA-NABA featherweight title, to Jesus Rojas, 25-1-2 (18), of Caguas, PR, at 1:47 of the eighth round of a title eliminator. In the opening round there was no feeling out as both fighters were throwing bombs. Lopez got the better of the two. In the second round a solid left hook by Rojas to the chin of Lopez made him wobble back and another left hook made Lopez took a knee. In the third round Lopez came back in a continual slugfest getting the better of Rojas. In the fourth round a Rojas left hook to the face of Lopez bloodied his nose in knocking Lopez down. By the end of the round Lopez was back on top. The next 3 rounds went back and forth. In the eighth round 3 Rojas rights to the head of Lopez and down he went. Upon getting up Rojas was all over Lopez until referee Tony Weeks stepped in and waved it off. Middleweight southpaw Yamaguchi Falcao, 13-0 (6), of Sao Paulo, BRZ, dominated Morgan “Big Chief” Fitch, 18-1 (8), of Pittsburgh, PA, over 10 rounds. Through the first 3 rounds Falcao was the aggressor and used his speed of hand to get the best of Fitch. In the fourth round with his trainer Tom Yankello urging him Fitch came forward hurting Falcao with a body shot. Falcao returned the favor with a glazing right off the chin of Fitch that had him ducking and moving to avoid another punch. In the fifth round the smaller Falcao used his jab more than the much bigger Fitch. In the sixth round a straight lead left and followed by a right hook from Falcao rocked Fitch whose right eye looked very red. In the eighth round Fitch had swelling over the left eye from lead straight lefts zeroing in from Falcao. In the last two rounds Falcao was showboating being much quicker than Fitch who couldn’t take advantage of it. Judges scores were 100-90 as did this writer. Super lightweight Vergil Ortiz, Jr., 5-0 (5), of Dallas, TX, stopped Pangel Sarinana, 7-6-2 (3), of MEX, at 1:43 of the third round. In the opening round it was all Ortiz throwing nothing but bombs but failing to get his fifth straight first round knockout. In the second round Sarinana got his punches in with combinations in a close round. In the third round a vicious right uppercut from Ortiz to the chin of Sarinana and down he went. Upon rising referee Jack Reece had Sarinana take a couple of steps and wisely decided to stop it.